Well, after about a month of being stuck in the same place, I finally saw some results this week. Kind of strange really, given that a trip away involved a few unpointable meals. I lost 3.5lbs this week. This means I've got 2lbs left to go. Given that I've made the most of my birthday, it's unlikely to be this week but I hope to see it before the end of October. This puts me at 25lbs lost in total. The weekend has involved a Mark Morriss gig, an excellent meal at Jamie's Italian with some friends and lunch with my Dad. The following picture makes me rather happy and was the highlight! 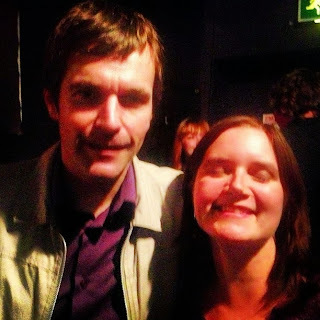 Yes, my eyes are closed but it's Mark Morriss (formerly of the Bluetones). Who recognised me from my Twitter avatar. All is good. 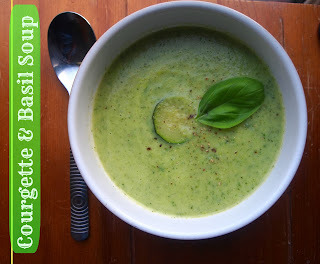 I've made this soup before and shared it with friends. I love how simple it is, with so few ingredients but a good whack of flavour. If I were feeling a little more in need of using points, or for a bit of luxury, I'd switch the basil for a tablespoon of pesto - adding an extra propoint per serving. I use semi-skimmed milk to make it something that D can share but it actually makes no odds to the propoints value if you make it with skimmed anyway. It would just make the soup a little thinner. Stats: - 5 servings, 1 propoint each. Melt butter in a large pan. Add the courgette and cook at a medium heat for five minutes. Add stock, bring to the boil, cover and simmer for twelve minutes. Add milk and basil. Blend until smooth. Gently reheat. I'm entering this for Tinned Tomatoes' October No Croutons Required challenge. 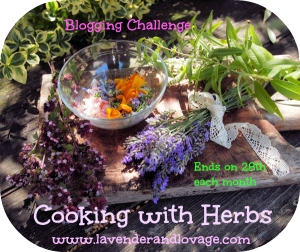 I've also entered this for the Cooking with herbs challenge.